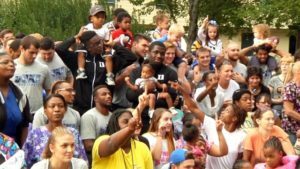 Win or lose (or in-between, see “Miami, 2015”), Blue Devil Network helps make it a blast to follow Duke football. While each video is worth watching once, there are certain videos that make you (my daughter, Abigail, anyway) feel compelled to watch them again and again and again because they make you laugh, cry, or just feel proud to be a Devil. It is those extra special videos that we will recognize here. Nominee 1: Danny Doyle Earns a Scholarship! 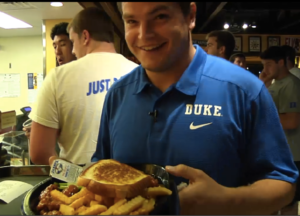 There’s clearly a funky dynamic between the walk-ons and the scholarship guys (Check out @DukeFBWalkons on Twitter.) This video gives you a glimpse of that special moment when someone crosses over. Nominee 2: Game Night Not surprisingly, Thomas Sirk, a QB can beat Chris Taylor, a WR, at corn hole. Unexpected was that that Edgar Cerenord and Mike Ramsay play spades, and Twazanga Mugala likes Nutella with his banana split. Who knew? 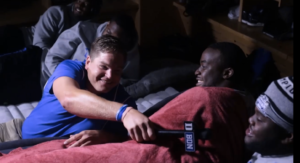 Nominee 3: Yohtel Duke – These guys take naps? One of the most creative videos ever from BDN. Dave explores the team politics surrounding inflatable mattresses while the guys catch some Z’s. 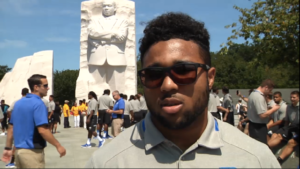 Nominee 4: Duke football visits Washington, DC Contains the immortal words by Shaq Powell, “Duke- we have history- a very proud and strong history and it’s the same thing with America”. Nominee 5: Cut recreates Yankee Stadium in Pascal Field House The perks of being the head coach on display (Cut’s a Yankee fan, unfortunately). . 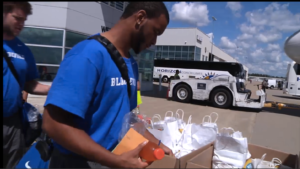 Nominee 6: Campus Cleanup – Leaving Duke better than they found it! 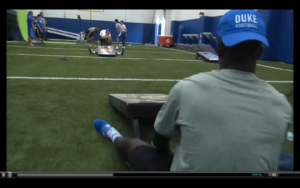 Over at Carolina, I’m sure the players throw the trash on the ground (Evidence: they destroyed our locker room); at Duke, the players pick it up. Nominee 7b: “Thick Thursdays”- The OL never goes hungry, especially on Thursdays. Nominee 8: A trip to the Durham Rescue Mission ALL the kids have happy faces (including the ones that weigh 300 lbs.). The Winner for Paul for Best “Behind the Scenes” video is Yohtel Duke. The winner for Abigail is Campus Cleanup. 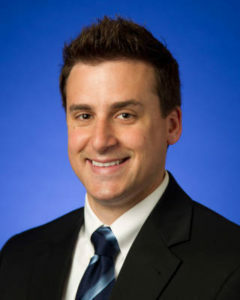 Nominee 1: Belk Bowl Shopping Video “I’m trying to find some jeans … gotta get myself a girlfriend somehow” – Dave Harding. Abigail tells me the jeans paid off big for Dave – he finally did get a girlfriend. Nominee 2a: Braxton Deaver in the Cold Tub – “Booties are for those softer kids”. Doing interviews in the (apparently REALLY cold) Cold Tub is sheer genius. Nominee 2b: Chris Taylor in the Cold Tub – “I get these booties to cover my toes” The perfect complement to Devo’s time in the Tub. We learn who is one of those softer kids! The winner for Paul in Funniest Video is Dave and his jeans (don’t ask me why). For Abigail, it’s all about the Cold Tub. 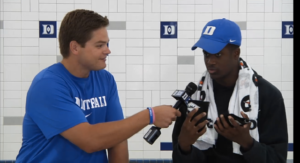 Nominee 1: Coach Cut – “Duke Football? 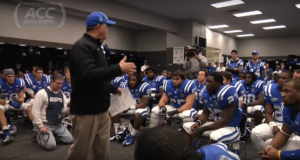 Hell Yeah, Duke Football!” Cut’s rousing speech before the Belk Bowl is one to truly savor. Of all the Duke Bowl games, this is the one we really should’ve won (more so than even the Pinstripe, which we did win). Details, details… heckuva speech. Nominee 2: 2013 Year in Review (Coastal Championship Year in Review) “I’m almost ready to cry for one, but I’m just so proud of so many people. This is about a lot of people and that’s what’s so beautiful about it”. Coach always takes all the blame, and is incredibly generous with the credit (exact opposite of Chip Kelly after this year’s Notre Dame game) This video is over 7 minutes of sheer joy and inspiration. You’ll love seeing Laken Tomlinson again, if only briefly – the quality of that guy and his influence on the program is off the charts. Ross Cockrell shouting “You gonna run from it, you gonna run to it!” is one you’ll quote again and again. Bonus points for him saying “We have the character, we have the athletes, we even got the grades!”. Kudos for Carolina for at least having the athletes – the other two … not so much. Nominee 3: The Team visits the El Paso Children’s Hospital at the Sun Bowl The team visits at Christmas and distribute goodies, including bracelets Abigail had made. (So naturally, a must nominee. Checkout www.braverybracelets.football for more about that.) In this video, we meet a very young Chris Taylor, who obviously touched a number of young lives that day. The winner for Paul as Most Inspirational video is the 2013 Year in Review (aka “7 minutes of sheer awesomeness”). For Abigail, it’s all about bracelets at the Sun Bowl (no shock here). Before we announce the overall winner, special recognition goes to Ryan Craig for the pronunciation guide on the Roster. 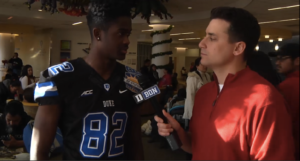 Who knew folks struggled to pronounce “Cutcliffe”? Check it out now before it’s gone. We discovered it by accident by clicking on the ears by some of the names. Amaze and astound your friends! Finally, the GRAND PRIZE WINNER. The only fair way to choose was to base it on which video Abigail’s watched the most. In a landslide, the winner is Cold Tub Chronicles! 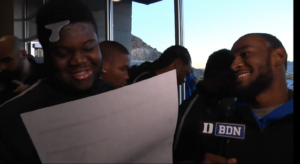 (She’s earned the right to pick the winner – nobody can be a more active consumer of BDN Duke Football). 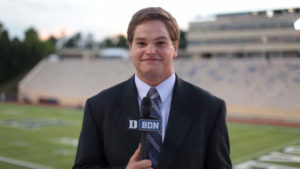 While Dave’s Belk jeans turned his life around and put him on a path to glory, I’m certain the real stars of BDN are the folks we don’t see on film. Mega kudos to all of them. Keep it coming! We’re still waiting for you to organize a dance contest, tell us more about roadtrips, and take us behind the scenes for a day in the life of Coach Cut. Your work is far from over. 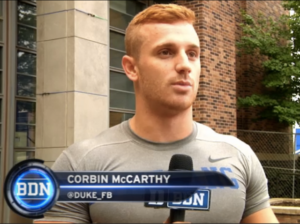 Sincere thanks from all of #Dukegang for what you all do.